Around 420 million bus passenger journeys are made annually in Scotland, covering over 330 million kilometres per year. Bus provision is important for the Scottish economy with around one in ten people using the bus to travel to work on a daily basis. We found that fares vary substantially across Scotland’s bus routes, ranging from 7p per mile to £1.80 per mile. 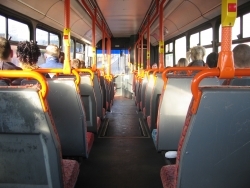 In some areas bus journeys were costing job seekers up to 15% of their income for one return journey to the nearest job centre, while a round trip to a local supermarket could cost someone on full time minimum wage 5% of their weekly income. Local Authority subsidies to bus services last year ranged widely, from £108 per adult in the Western Isles to as low as £0.55 in Aberdeen City. “Scotland’s bus network plays a vital role in keeping its citizens moving and accessing essential services every day. However, with this report we have highlighted specific examples of where access to services can be difficult due to long distances, sparse timetables and expensive ticket prices. “For many in Scotland’s cities and large towns bus connections can be frequent and relatively affordable, while in more rural parts of Scotland we have found communities that contend with twice-daily services that can cost a substantial proportion of weekly income to make necessary journeys. “For example, those in the remote and rural areas we surveyed paid an average price of over £9 for a return journey to the nearest job centre. While some jobseekers and others can receive a discount on tickets this still represents a significant cost for those already struggling to make ends meet on a low income. In many areas, we found that price information was not available upfront, which made it difficult for consumers to plan and budget properly.